The legend goes that it was Phula Bai who decided that the Garasias make the place, with a flowing stream at the foothills of Mount Abu, their village. 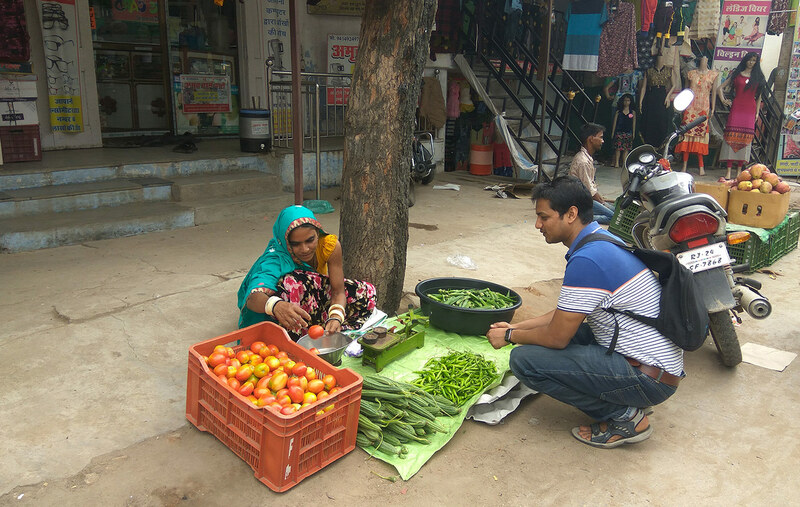 More than 100 years later, another tribal woman from the Phulabai Kheda village was on a different mission: to carve her space in the main market of Pindwara block of Sirohi district to sell vegetables. “My heart was pounding and my legs were shaking. I was the first women from my village to set up a stall in the market. I still remember my first customer. She was an old lady. I did not even have the courage to quote her a price. She purchased a kilo of ladies’ fingers and gave me Rs 20” says Rekha Bai with a shy smile. PRADAN professionals formed the first SHG of the Garasia tribes in this village in 2016. Garasia women are at the bottom of the pyramid with very little education or empowerment. The village itself is 15 kilometers from the market place. An exposure visit to the adjacent block of Abu Road, where SHGs were working on multiple issues of development in their village was organised. The excitement was palpable. The women were in a different block not as casual laborers but to learn new methods of agriculture cultivation. “I understood the potential of my farm land in that visit”, recalls Rekha. But there was a problem. Her husband worked in a stone quarry and would be away for days. He barely earned enough. Being the mother of three small children, she needed his help in the farm. But he was unwilling. She borrowed Rs 10,000 from the SHG and gave it to him to start a snack shop on the main highway near the village. That would keep him near home and he could support in the farm. The shop closed down in a month’s time as he was unable to manage it. 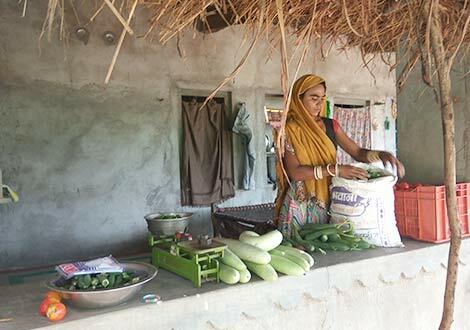 In the meantime, through multiple agriculture trainings in the village, Rekha had diversified from traditional practice of corn cultivation to growing multiple vegetables in her farm. 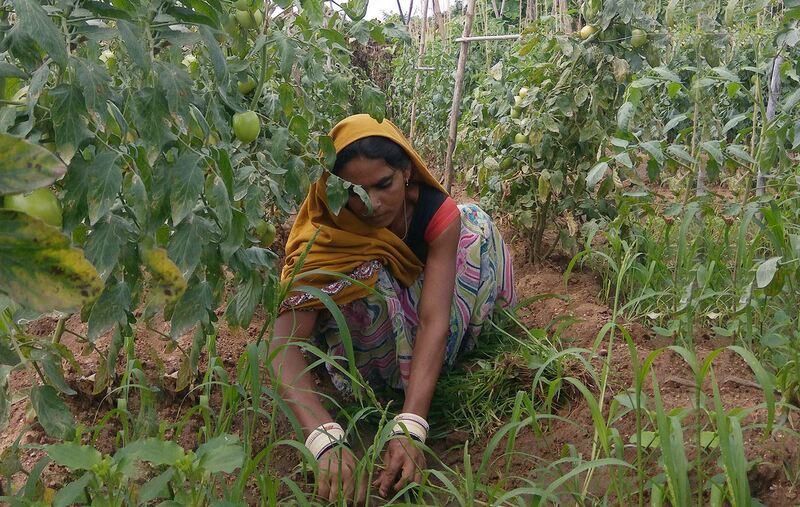 She took another loan of Rs 15,000 from the group to invest on her farm. She returned the money in small installations to the group. In the first year, the family earned a profit of Rs 70,000 from vegetables. This was a jump of Rs 45,000 from the previous year when they grew corn. This was all sold at wholesale rate in the market. One evening this Garasia woman, who could only sign her name, did some quick thinking. It was the month of June in 2018. Rajesh, her husband, was unwilling. It was then that she decided to break many taboos and stereotypes. Weighing machine and crates were bought home. She picked her vegetables from the farm and asked her husband to carry it to the main road. She hailed a running auto there and headed to the market of Swaroopganj. She spread her mat near a shoe-shop in the market. Rekha was apprehensive- women from her village had always been buyers in the market. She was sitting there as a retailer. An old lady came first and then another man with a red turban. The rest she does not remember much. For the first three evenings she was in a daze, unsure if this was even real. It was only after a week that it dawned to her that she was now a “Sabjiwali Bai” (The Vegetable Woman). “I am no more confined to the four corners of my village”, says Rekha emanating a radiant smile. It is in the evening that she goes to the market for three hours for three days a week with ladies’ fingers, chili, brinjal, cow-pea, tomato, bottle gourd and ridge-gourd. This three hour investment fetches her about 900 rupees per day. The gender relationship in the household has also changed significantly. Her husband shares equal responsibility of raising their children and cooks regularly when she is away working on her farm or is in the market. The Sabjiwali Bai will have no other way. Copyright © 2005 - 2019 Pradan. All Rights Reserved.